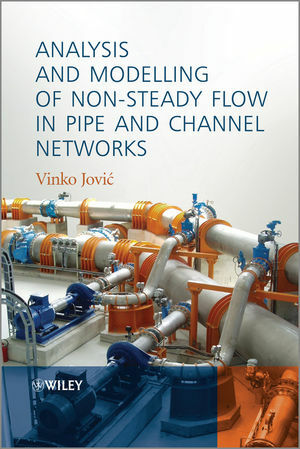 Analysis and Modelling of Non-Steady Flow in Pipe and Channel Networks deals with flows in pipes and channel networks from the standpoints of hydraulics and modelling techniques and methods. These engineering problems occur in the course of the design and construction of hydroenergy plants, water-supply and other systems. In this book, the author presents his experience in solving these problems from the early 1970s to the present day. During this period new methods of solving hydraulic problems have evolved, due to the development of computers and numerical methods. This book is accompanied by a website which hosts the author's software package, Simpip (an abbreviation of simulation of pipe flow) for solving non-steady pipe flow using the finite element method. The program also covers flows in channels. The book presents the numerical core of the SimpipCore program (written in Fortran). Analysis and Modelling of Non-Steady Flow in Pipe and Channel Networks is an ideal reference book for engineers, practitioners and graduate students across engineering disciplines. Vinko Jovic is a Professor and the Head of Department for Hydraulics and Hydromechanics in the Faculty of Civil Engineering at the University of Split. His research interests also include numerical modelling. He has circa 60 published papers and has written two books in Croatian. He is the creator of a software package called Simpip (an abbreviation of simulation of pipe flow) which is used for solving non-steady pipe flow using the finite element method.